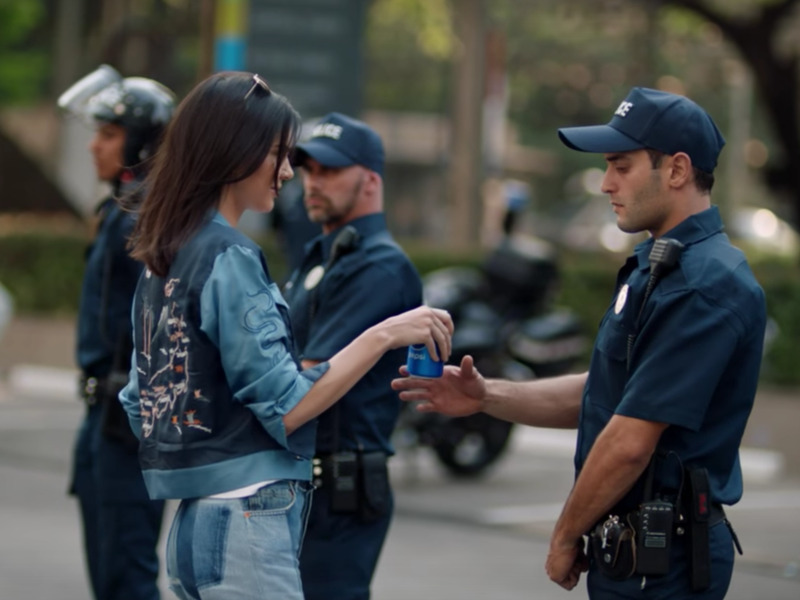 Pepsi just debuted a controversial new ad in which Kendall Jenner ditches a photo shoot to join a cute boy at a protest — and give a police officer a soda. Walking through the group, she grabs a Pepsi and hands it to a stone-faced police officer watching the protest. His face breaks into a smile, and the crowd breaks into cheers. “Live bolder. Live louder. Live for now,” the screen reads. The commercial immediately rubbed many people the wrong way, with critics saying that Pepsi co-opted protests as a fun, trendy activity, instead of something people participate in to draw attention to social and political issues that, for some, are matters of live-or-death importance. In “Elle,” Jaya Saxena notes that the commercial seems to draw from a photo of a black woman being arrested at a 2016 Black Lives Matter protest. At least Kendall’s mother is proud of her. I’m actually disgusted right now. What kind of privilege must you have to think handing a Pepsi over is something groundbreaking? Pepsi just made the commercial of the year for Coke.